BET aired a three-part miniseries depicting the decades long career of the R&B group New Edition last week. And it is a HIT!! The New Edition Story begins with 4 little boys that grew up together in the Orchard Park projects in the Roxbury neighborhood of Boston, Massachusetts; the original New Edition members: Bobby Brown, Michael Givens, Ralph Tresvant and Ricky Bell. 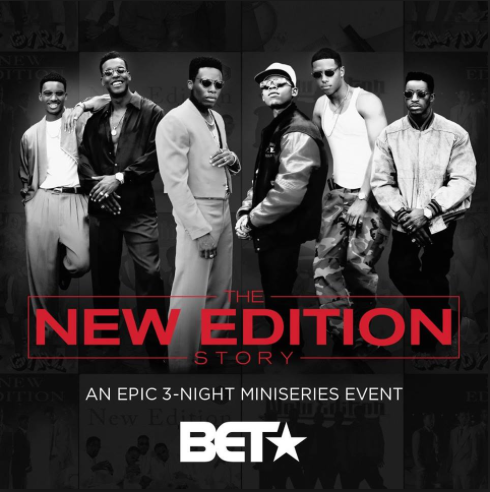 Through the story we find out how the group grew to 5-members with the addition of their manger's nephew, Ronnie DeVoe and ultimately to a total of 6 (sometimes 5--long story.Watch the miniseries!) members when Washington D.C. native, Johnny Gill, joined in time for their third studio album. The greatest takeaway from this biopic, for me, is the love the members have for one another regardless of all else. The depiction of grand success achieved together, and within that story, a sub story of a single member's personal issues that threaten that success and the dilemma these young men were faced with of whether to throw their brother off the ship or all drown. As well as the rise of individual members that reached solo success that many would say overshadowed any prior success the group achieved as a collective unit. All of the setbacks with personal issues and games played by music executives, as well as step ups as the group gains notoriety and a keen sense for how to best navigate the industry are displayed in The New Edition Story and in the end, the boys that grew into men before their fans' eyes have forgiven past transgressions and have a genuine love and camaraderie for one another. All of the love, the struggles, hardwork and dedication that created New Edition in the late 70's and to this day maintains the group is relayed so well through this miniseries. BET got it so right with this biopic! (It really touched my soul.) Great production and an awesome cast! And y'all know there is no denying the solid hits the men of New Edition has a a group as well as individuals and (one) smaller group. So, click HERE to jam to the Ultimate NE Playlist on Apple Music.